Farrar, Straus and Giroux (BYR), 9780374379728, 40pp. These look-alike twins have always shared everything—their room, their toys, a crib, and, since the day they were born, a blanket. But as they grow into new beds, they need new blankets, too. Now they face a new dilemma: they don't know how not to share. Told from the perspective of two five-year-olds, The Twins' Blanket playfully illuminates squabbles and affection between young siblings. Yum's minimalistic art astutely captures these twins' emotions as they toss, turn, and tug their new and old blankets—and embrace their growing independence. 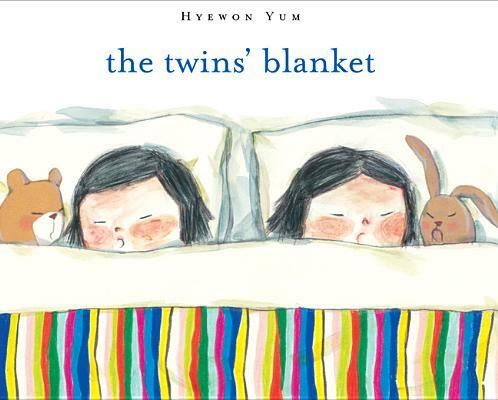 Hyewon Yum is the author and illustrator of several acclaimed books for children, including This Is Our House, The Twins' Blanket, There Are No Scary Wolves, and Last Night. Her book Mom, It's My First Day of Kindergarten! received the Ezra Jack Keats New Illustrator Award. She lives in Brooklyn, New York, with her family.